Today, the rapid development of many emerging cutting-edge technology, one of which is the digital currency commonly called Cryptocurrency, many types ranging from borrowing services, gold, courier, tickets, etc. Well, this time I want to introduce to my friends, this first in the world, the blockchain that adopts about health, the company called Bowhead Health. Currently, the quality of health services in the world is doomed when the global health market is turning very fast and rising, and there are still people who are not healthy. Even generic drugs that are said to be cheap can not be reached, even though they live in developing countries, in some developing countries also do not have an adequate technology. But all of that hopefully can change from the findings of this technology is all paced digital, from digital disease prevention, consulting, until the delivery of drugs, hopefully, human life on earth can be long. All that can not be separated from tools that can be used at home to facilitate the diagnosis of the body, this is really revolutionary progress in health care. Benefiting this transparent Blockchain system is perfect for patients who want to use Bowhead digital currency to pay for health and drug consultations. Patients may also participate in a healthy activity program for therapy. Its founders alone consist of reliable doctors who are ready to serve the health of mankind. Here is a picture of the machine that will be used later, for over a year Bowhead has developed this platform and until now they are still developing this machine until the final. This tool is definitely connected to the internet network because the health division team is far away, which of course this tool is at home. The health team will check the health of the home users so that they can advise users if their health declines or those who need serious attention. 1. Users give blood or saliva samples to be inserted into machine diagnostic containers. 2. This device will use a special programming language to analyze the sample with the strength of the chemical reaction signal. 3. All the signals are sent with blockchain technology so it is safe and the doctor is comfortable to provide diagnostic results after the test. 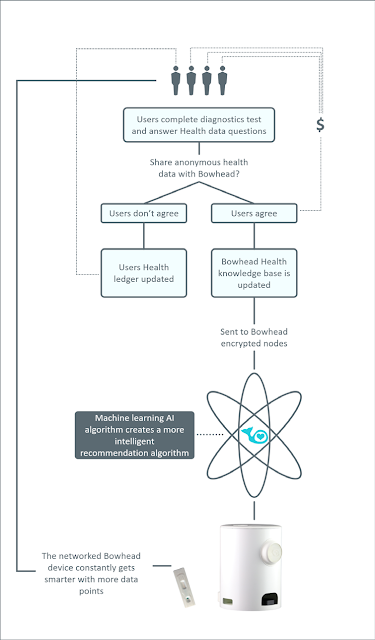 There are several companies that are working on such tools to diagnose user health, but Bowhead has not found a key point for customer satisfaction. The bowheads use an IP and analytic block system that will continue to be developed that can help the continuity of diagnostic progress. Keep in mind that Bowhead Token for Crowdsale (the term promo) is not available to US and Canadian communities. This token is closed-end meaning that Bowhead offers shares to investors within a certain period of time and can not be resold to Bowhead. This Singapur-based company will issue a maximum funding supply of 100M WAVE. Bowhead will open a token promo on July 17, 2017. All bonuses have schedules, the bonus is quite up to 60% not to miss the interesting investment, health certainly needed.